This is the fifth post in my series STEM Toys for Kids that Parents Will Love. Check out my other posts in this series by clicking on the images below. Introducing the Yellow Scope Chemistry Kit. Yellow Scope is a company founded by two scientists who are also moms. Both scientists have daughters and sought out to create a product that could help make science accessible to young girls. The kit itself comes with real lab equipment and a very well-thought out lab notebook which outlines 19 different experiments for the child to conduct. The really cool part is that it comes with the chemical ingredients sodium bicarbonate (aka baking soda) and citric acid (this is a chemical commonly found in lemons and other sour fruits). It also comes with food coloring and other colored tablets. This is great because the child can do a number of experiments with these ingredients without having to purchase any additional materials. What I really love about this chemistry kit is the lab notebook. It’s colorful, well laid out, and filled with cute cartoon-like characters. The notebook feels like a combination of a cute chapter book, a standard lab notebook, and a textbook. For each experiment, the notebook does a wonderful job of encouraging the reader to follow the scientific method. There’s always space for the child to make a hypothesis, describe what happened in the experiment, and to make a conclusion after each experiment has been conducted. There’s even parts of the book where they encourage girls to think about mistakes differently when it comes to science. With this product, you can teach your child the in-and-outs of the scientific method in a fun and entertaining way. It can provide an avenue for your child to experiment freely, make mistakes, and learn how hands-on chemistry can be. By working through the lab notebook, your child will learn what chemistry means, the definitions for a chemical reaction, atoms and molecules. To put it simply, I wish I had this when I was a child - before my first chemistry class. By presenting chemistry as a “toy,” it makes it so much more accessible. Less like work, and more like an invitation to discover something new by “playing” a scientist. 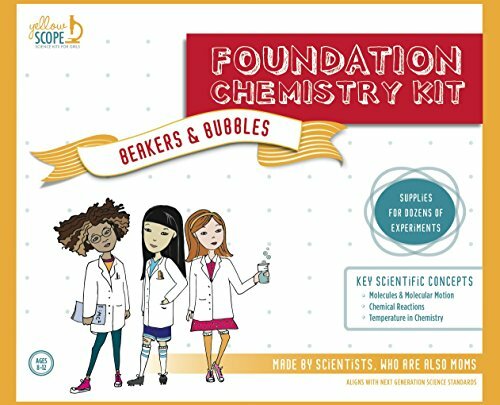 The Yellow Scope Chemistry Kit is listed on Amazon as $44.00. You can purchase it by clicking the "Buy on Amazon" button below. Happy science'ing!